I bought those ornaments in a bag of other ornaments from a chain store years ago, and when the Princess was a baby, she kept pulling one off the tree, which distressed her Big Bother greatly. "NO!" he kept saying. "Not the CHRISTMAS CARROT!" Thus it was christened, and thus it has ever been. It's a good thing there are two, because the kids greet them with huge excitement every year, and I know there would be a fight if we had only one. I'm waiting for the year they ask, WHY do we have Christmas Carrots? but so far, so good. 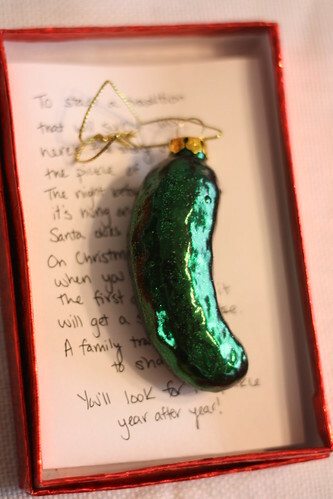 and I knew I had to have a Christmas pickle. I love creating or adapting bizarre or fun traditions, and I think my kids will love this (so will Daddy, who will be roped in to hide the pickle). Anyway, rather than leave this post till closer to Christmas, I decided to publish it now, because if you want to get yourself a pickle (or, indeed, a carrot or two) you'll need to get busy. I could only source pickles from overseas, and don't even get me started on the postal 'service'. BTW -- these are often described as a German tradition, but they're not. Pure US of A! Christmas pickle? I'll pass on that one and stick with regular ornaments. I do like your Christmas carrots though. My mum had similar ornaments years ago. They're so cool, mostly for the entertainment value! HAhaha!! LOVE the Xmas carrot!!! But if I was Daddy, I wouldn't want to hide the pickle because I'd want to lead the hunt to find it!!! I think the prize might be a bag of lollies so Daddy probably WILL want to be the one who finds it!